Years ago, I just had to learn how to make zucchini cookies recipes. Not just for cookies but I had to find all kinds of recipes to use zucchini in. If you grow your own zucchini or know of people who do then you know what I mean. During the summer, zucchini seems to be one of the most abundant crops. Quite often gardeners will place free zucchini out by the road for anyone to take free. I hate to see any food go to waste so I find ways of using it. This is why I have learned how to make zucchini cookies recipes, cakes, breads, wonderful casseroles and other great zucchini recipes. If I cannot use it, I make recipes to give to family, neighbors and friends. People cannot believe all the foods in which I put this wonderful vegetable. When you learn how to make zucchini cookies recipes, they will include this vegetable either fresh or cooked. When fresh, they will specify grated or shredded. More often they will be grated which blend easier into the dough. Sometimes the recipe will ask for pulp, puree or mashed. For this, cook the zucchini first and then proceed to mash with a mixer or make into a pulp or puree in a food processor. With any of the cooked methods, nothing else is added (Unless specified in the recipe). 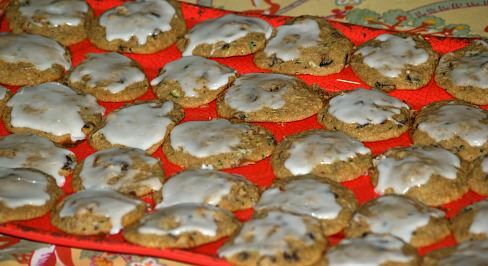 I learned how to make zucchini cookies recipes by adding many different ingredients. Some of these ingredients have always been included in many of my favorite cookies. It was natural for me to add these to the zucchini cookies recipes. What delicious cookies! I was never disappointed! The zucchini pineapple cookies recipe is a perfect example of my satisfaction. I have always loved pineapple cookies since I was very young. We made these in school when I was very young. I was instantly addicted! Combining the pineapple and zucchini made a great combination! Of course, when I learned how to make zucchini cookies recipes, I had to try some with chocolate chips. Perfect combination! Imagine soft moist cookies with chocolate chips. Wonderful. Try all of these recipes. You will love them. Learn how to make zucchini cookies recipes with pineapple. These cookies are so delicious and moist! 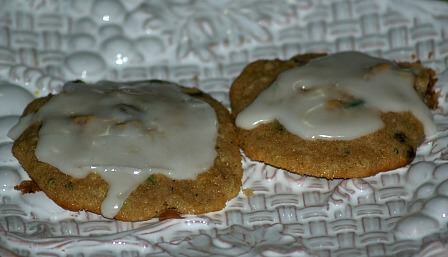 When I learned how to make zucchini cookies recipes, this was one of the first ones I made. NOTE: Place zucchini and pineapple in a clean dish towel; wrap and squeeze out liquid). This recipe makes a soft batter so I feel this is an important step. Set aside. Combine flour, cinnamon, nutmeg, baking powder and soda in a sifter; sift together. Cream sugar, shortening and eggs together on medium speed; add pineapple and zucchini. Add dry ingredients and mix on low until blended. Stir in nuts and raisins. Spoon onto greased (or parchment lined) baking sheets by teaspoonfuls. Glaze tops with powdered sugar glaze. GLAZE: 2 Cups powdered sugar, 1 teaspoon vanilla and a small amount of milk to make a glaze which drips from the spoon. TO MAKE CRUMB MIXTURE combine flour and brown sugar. Cut in butter and stir in nuts; set aside ¾ cup of mixture for topping. Press remaining mixture in bottom of 8 inch square pan; bake for 15 minutes and COOL slightly. TO MAKE FILLING combine cream cheese, sugar, zucchini, eggs, cinnamon, allspice and vanilla in large bowl. Beat mixture until smooth; pour over baked crust. Top with reserved crumb topping; bake 35 to 40 minutes until slightly browned. Let set until completely cooled; cut into bars. Beat eggs in a large bowl; add sugar and oil and beat well. In a medium bowl combine whole wheat flour, all purpose flour, baking powder, 1 teaspoon cinnamon and salt. Add flour mixture to egg mixture and blend well; stir in zucchini and raisins. Spread batter in prepared pan; bake for 40 to 50 minutes or until pick comes out clean. TO MAKE GLAZE combine all glaze ingredients; beat until smooth. Spread glaze over cooled pan; cut into bars; makes 36 bars. Preheat oven to 375F degrees; lightly grease cookie sheet. TO MAKE COOKIES combine brown sugar, butter, milk, vanilla and egg in a large bowl; mix well. Add flour, wheat germ, baking powder, cinnamon, salt and nutmeg; stir to blend. Stir in zucchini and raisins; drop dough by rounded teaspoonfuls on baking sheet about 2 inches apart. Bake 12 to 15 minutes until set and lightly browned; remove from pan immediately to cool. TO MAKE FROSTING heat butter over low heat until delicate brown; remove from heat. Mix in powdered sugar, vanilla and milk until smooth; spread over cooled cookies. NOTE: If necessary add ½ teaspoon at a time of additional milk to get spreading consistency. Cream butter and sugar on medium speed of mixer; beat in egg, zucchini and almond. Combine flour, baking powder and cinnamon; gradually blend flour mixture into creamed mixture. Stir in chocolate chips and nuts; drop by teaspoonfuls onto lightly greased baking sheets. Bake 12 to 15 minutes; remove to wire racks to cool. 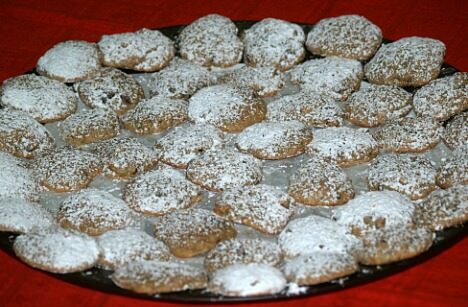 Sift powdered sugar over tops of cookies; makes 48 cookies.